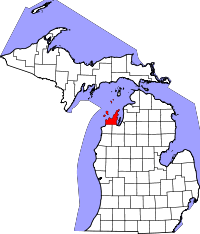 Most of Leelanau County borders Lake Michigan, and the vast majority of the county area is comprised of water; over 86% of it is water, in fact, making it the second highest percentage in the entire country. Despite the small amount of actual land in the county, the population is larger than some neighboring counties, with over 21,000 residents. The Leelanau County Clerk allows access to genealogists and vital records researchers during most business days during regular hours, however individuals are requested to call ahead or email prior to visiting since no access is allowed when court is in session. Also, since space is very restricted, only one researcher is permitted at one time. All records are available dated from 1867 to the present, with the exceptions of naturalization records, which are available from 1874 to 1928, and census records from 1894. Mail-in applications are provided on the County Clerk website.